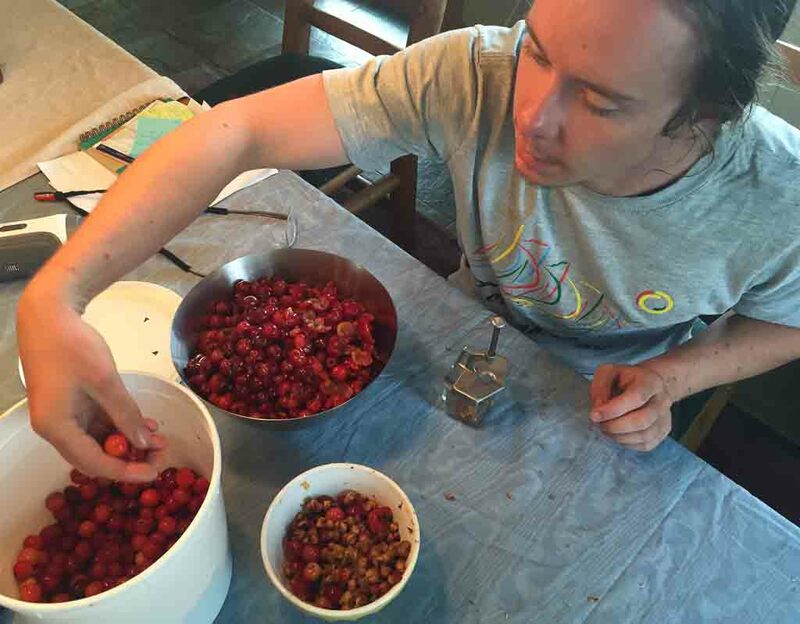 Why go to the trouble of making Sour Cherry Jam? Trust me, this tart, fruity spread has a flavor like nothing you can buy in a store. Most jams rely on traditional pectins which require the addition of a lot of sugar in order to gel. After trying several types of pectin I zeroed in on my favorite pectin – Sure Jell For Less or No Sugar Needed Recipes. Successful jams and jellies require a proper proportion of water, sugar, pH to make sure that the mixture thickens. 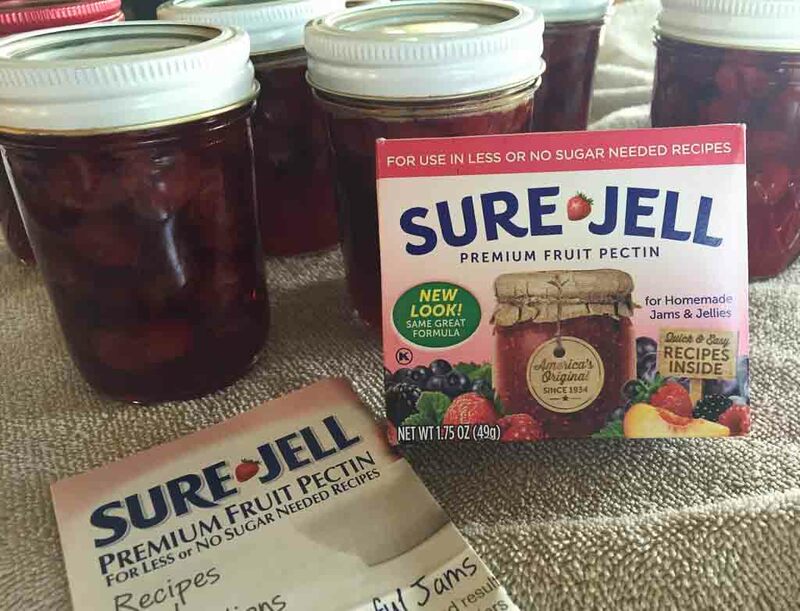 The Sure Jell for Less or No Sugar Needed Recipes pectin is more forgiving if your proportions are slightly off. Don’t be tempted to stray too far from the tested recipe because it will cause the mixture to not gel. Cherry syrup anyone? If you are interested in more canning recommendations with lower sugar or salt, check out the Colorado State University Extension fact sheet- Food Preservation Without Sugar or Salt. This recipe is adapted from the instructions found in Sure Jell for Less or No Sugar Needed Recipes - I follow their directions for low sugar sour cherry jam. If you don't have time (or desire) for water-bath processing, follow the pectin's direction to make a freezer jam. The process is slightly different than my recipe, but the ingredients are the same. Freezer jams take half of the time to prepare and have a fresh taste and bright color. While my recipe below can be stored at room temperature (in your pantry), freezer jams must be stored in a freezer. Both sour cherry jam versions should be refrigerated after opening. Sort cherries and remove all stems and pits. Using a food processor, pulse to chop the cherries or use a chopping bowl cut the cherries into 1/4-inch pieces. Place cherries and all of their juices in a Dutch oven. In a small bowl, combine the pectin and 1/4 cup of sugar. Stir until well blended. Mix pectin/sugar mixture into cherries. Stir over high heat until the mixture comes to a full rolling boil. If desired, add butter to reduce the amount of foam that forms on the surface of the jam. Stir in remaining 2 3/4 up sugar into the hot mixture and once again bring the cherry mixture to a rolling boil. Stir constantly to prevent scorching and boil for exactly one minute. Remove from heat and ladle into 8-ounce canning jars that have been thoroughly washed, leaving 1/4-inch space at the top (headspace). Wipe the top of each jar with a wet paper towel, then seal with a flat canning lid that has been prepared according to the manufacturer's directions. Screw a ring onto each jar that has been prepared with a flat lid. Tightening the ring too much will cause the jar to break, so just lightly tighten the ring. Place the jars on an elevated rack in a canner or deep pot of boiling water. Make sure that the top of the jars is covered by 1-2 inches of boiling water. When the water returns to a boil, begin timing. Process for 10 minutes plus any extra time to adjust for altitude. The processing time should be increased 5 minutes for altitudes 1,000 - 3,000 feet above sea level, 10 minutes for altitudes 3,001-6,000 feet above sea level, 15 minutes for altitudes 6,001-8,000 feet above sea level and 20 minutes 8,001-10,000 feet above sea level. Steamboat is located at 6,700 feet above sea level so I process my jam for 25 minutes. At the end of the processing time, turn off the heat and allow the jars to sit in the hot water for 5 minutes. Remove them from the hot water onto a towel and allow them to cool for 24 hours. Lower-sugar jams and jellies have a shorter shelf life than their full-sugared counterparts. I’ve never attempted jam making. Looks good! This looks great! I wish I had a source for getting good tart cherries on the front range. Nothing better than western slope cherries! Don't subscribe All Replies to my comments Keep the conversation going! You will receive an email when a reply has been posted to your comment. You can subscribe to all comments on this post or unsubscribe on the tab above. Enter your email address and we'll notify you when we post something new. Where in the world is Snowcat?